120 mm/50 QF Mk XI3 х 2 pcs. Initial HE Shell Velocity774 m./s. Initial AP Shell Velocity774 m./s. 533 mm QR Mk IV2 х 4 pcs. 20 mm Oerlikon Mk IV4 х 1 pcs. Lightning — British Tier VIII destroyer. The Lightning is a natural evolution from the Jervis, sharing a similar turret and torpedo tube configuration as well as performance characteristics. However, the Lightning mounts its 4.7-inch (120 mm) guns in new enclosed turrets capable of high elevation angles, thus allowing them to serve as anti-aircraft guns as well. These turrets also have the pleasant side effect of allowing them to clear the rear structure, thus allowing the forward turrets to also traverse fully. This allows the Lightning to easily maneuver while keeping its guns on target as it retreats. All gun turrets can traverse 360 degrees. Superb concealment with 8 km torpedoes, allowing stealth torpedo attacks. Access to Hydroacoustic Search consumable. High number of smoke charges with short cooldown. Short duration smoke discourages sitting in smoke and firing. No Engine Boost consumable makes escape nearly impossible if caught in a bad position. High shell arcs make long range hits against anything smaller than a battleship challenging. Short ship detection range for the Hydroacoustic Search consumable. 8km torpedoes may not be adequate in Tier X matches. Key skills for Lightning commanders include Last Stand, Survivability Expert, and Concealment Expert. It is recommended that captains use premium consumables to get the most out of the ship. 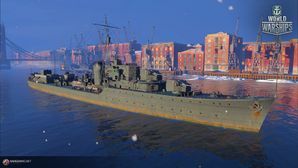 Players who wish to spend doubloons can equip Lightning with Type 18 camouflage that lowers her detection radius, reduces the accuracy of incoming shells, reduces her repair costs, and increases the amount of experience she earns. Lightning captains benefit from signal flags that enhance her main battery armament and torpedo armament, such as Victor Lima ( ), India X-Ray ( ), and Juliet Whiskey Unaone ( ). Sierra Mike ( ) is useful for increasing maneuverability. HMS Lightning was an L-class destroyer of the Royal Navy. She was launched on 22 April 1940 and sunk on 12 March 1943 by German Motor Torpedo Boat S-55. Ordered under the 1937 Programme and laid down as Job No J4502, Hawthorn Leslie & Co of Newcastle Upon Tyne were awarded the contract to build her with machinery supplied by Parsons. She would be the 10th Royal Navy ship to bear the name Lightning. Build was completed on 28 May 1941 but had been delayed by late delivery of the three twin 4.7-inch mountings required meeting the original design. The tender cost was £440,807 which excluded items such as weapons and communications equipment supplied by the Admiralty. On 25 March 1942, Lightning was adopted by the Borough of Doncaster as part of a Warship Week National Savings plan. Doncaster and the surrounding boroughs raised over £800,000 in National Savings and effectively paid for the ship. At the same time T/S Lightning was formed in Doncaster for Sea Cadets, that continues to this day. This page was last modified on 18 October 2018, at 01:24.